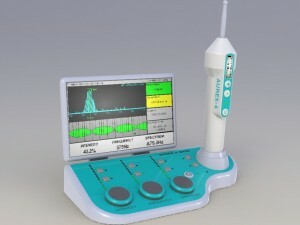 Aurex-3 - ADM Tronics Inc.
patient hears ringing or other sounds originating in the ear. The system includes an electrodynamicallyactuated diaphragm and probe assembly acting as an applicator to which is applied a complex signal in the sonic range to cause the probe to vibrate in accordance with the signal and the diaphragm to audibly reproduce the signal. 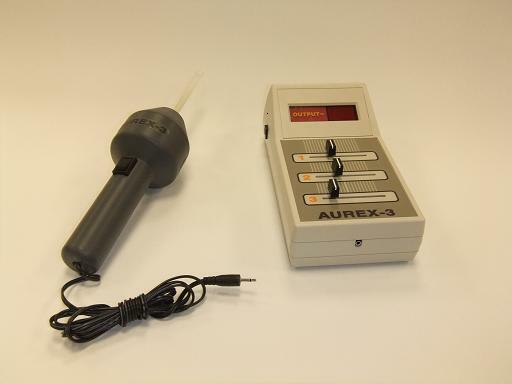 Currently ADM is in the process of modernizing the Aurex-3 for a prescription like settings in a physician’s office. The applicator will be a self contained rechargeable device that is programmed from a console that displays and wirelessly adjusts the frequency characteristics of the applicator.